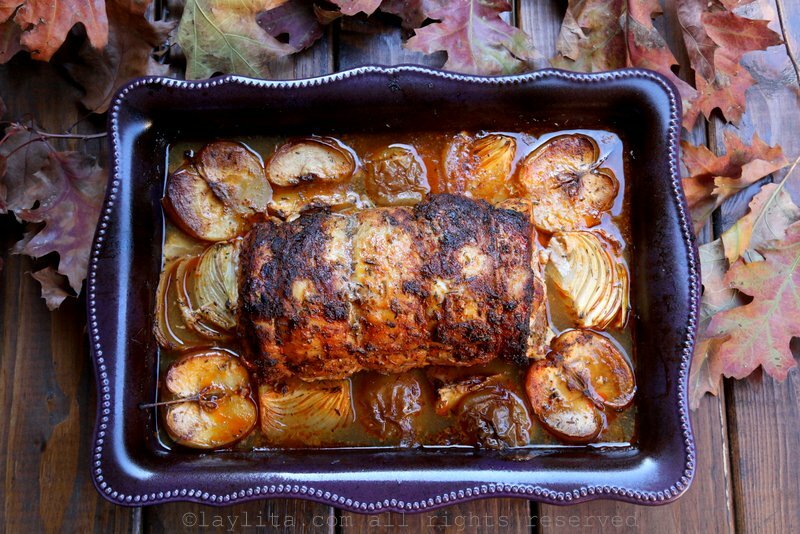 This apple cider roasted pork loin recipe is made using a large pork loin roast, which is stuffed with whole cloves of garlic, and rubbed with a seasoning mix of thyme, mustard, onion powder, paprika, and Piment d’Espelette (or any spicy hot chili powder), then baked in hard apple cider with fresh apples and onions. 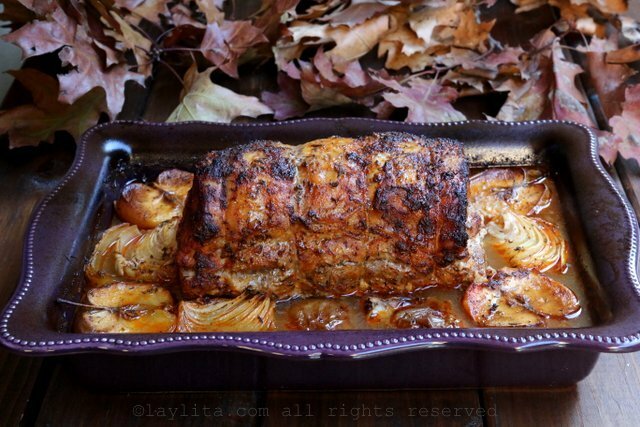 This pork loin recipe was meant to be posted a couple months ago; however I’m just getting around to it. 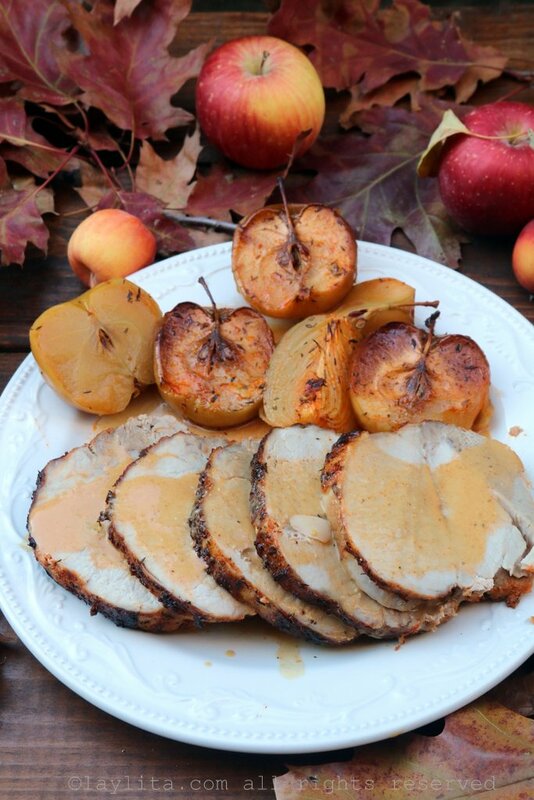 Easy recipe for apple cider roasted pork loin, made by baking a garlic stuffed pork loin roast with hard apple cider and ripe apples. 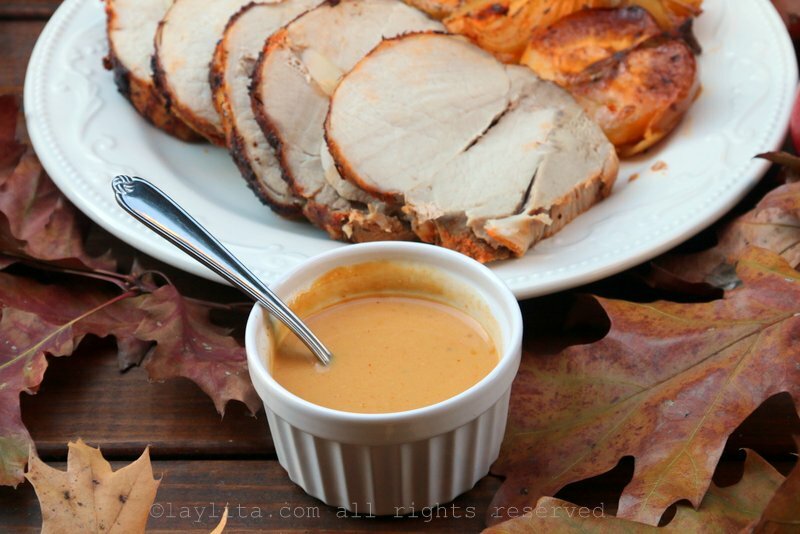 Served with an apple cider gravy sauce. 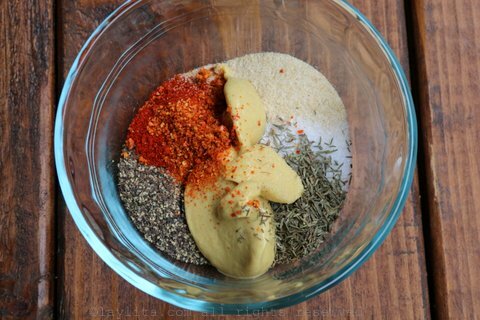 Mix the seasoning rub ingredients together in a small bowl. Stuff the pork loin with garlic cloves by making incisions into the meat and then pushing the clove into the meat. If the pork loin isn’t tied, use cooking twine to tie the meat. 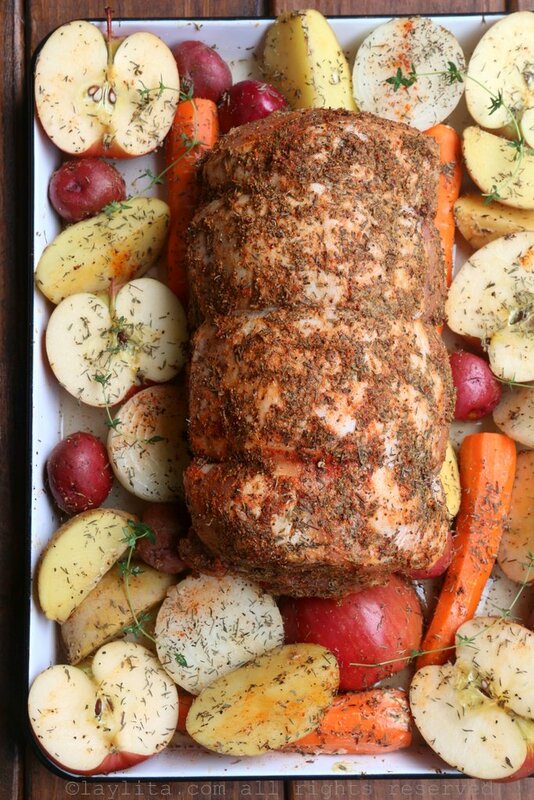 Rub the pork loin roast with the seasoning mix, save a small amount for the vegetables. 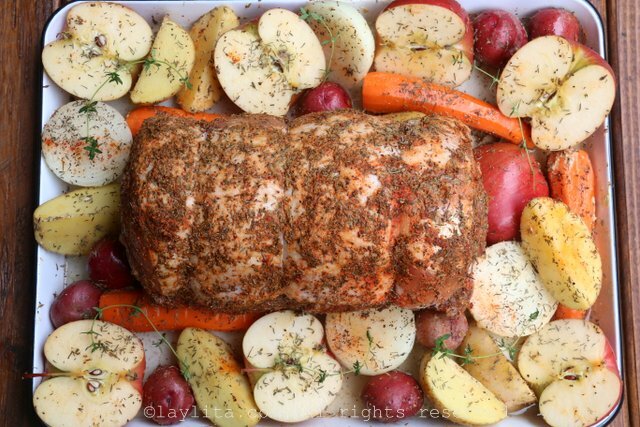 Place in the pork in a large roasting pan. 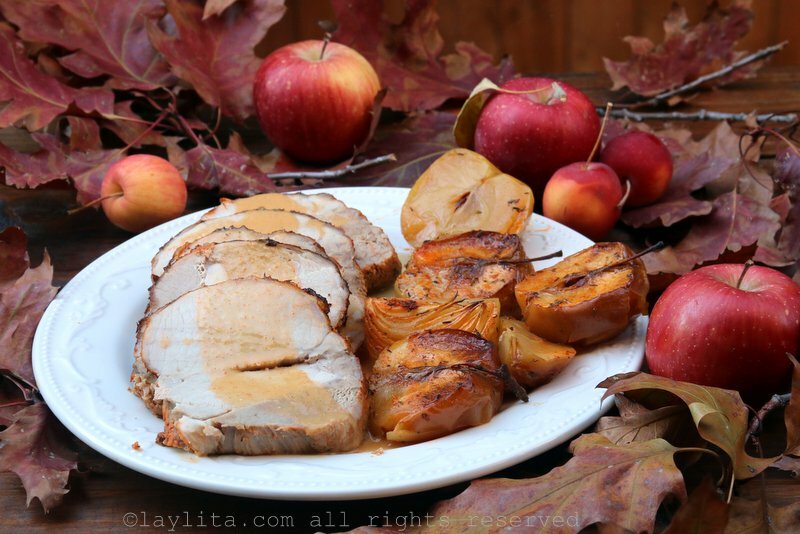 Arrange the apples, onions and other vegetables around the pork loin. Pour about 2 cups of apple cider into the pan. Lower the oven temperature to 350F, baste the pork loin with the juices (add additional cider at any point if the juices start to dry up). 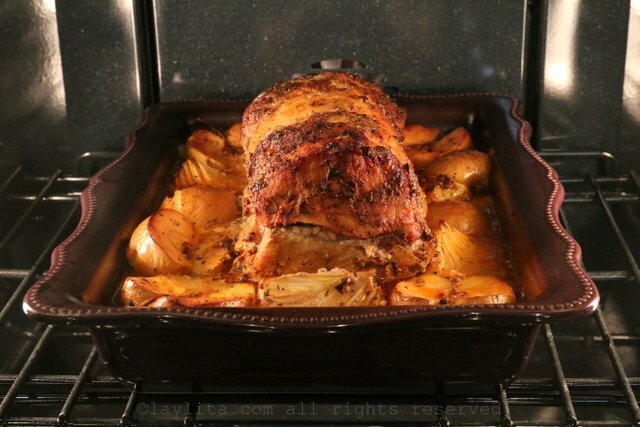 Bake for about 1 hour, basting every 20-30 minutes, cover the pork loin with foil if needed. 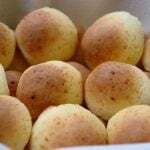 Bake for another 20-30 minutes, and add butter (cut in pieces) during the last 10 minutes. 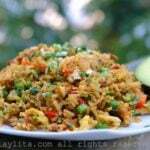 The interior temperature should be 145F. 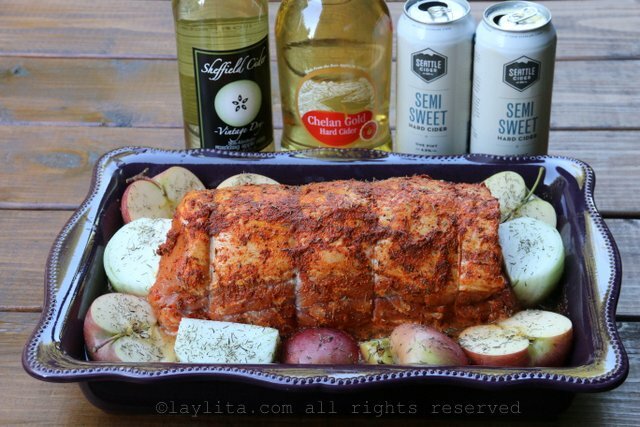 Let the pork loin rest for about 10 minutes before cutting and serving. Put the strained pan sauces into a small sauce pan and cook over high heat until it’s reduced by half, about 10-15 minutes. 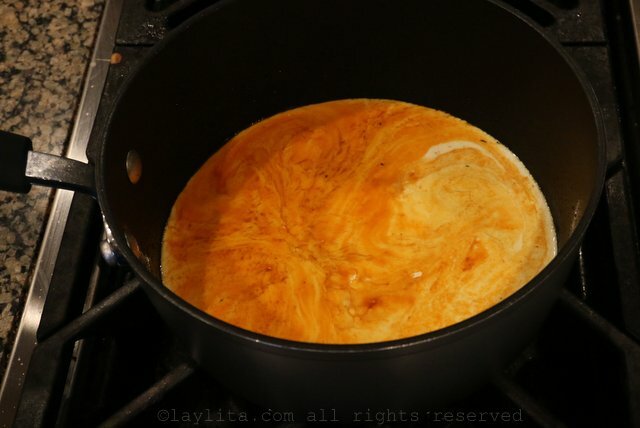 Stir in the cream and let the sauce cook over medium/low heat until it starts to thicken. Add the balsamic vinegar and the calvados/cognac/brandy. 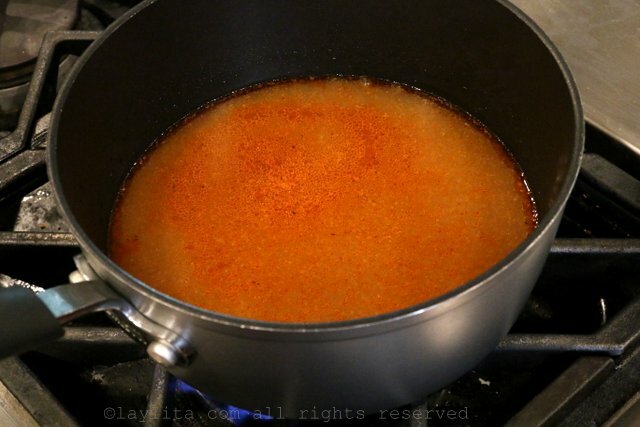 If you want a thicker sauce, add a tablespoon of cornstarch (with the cognac), and cook/stir until the sauce thickens. Another option for a thicker sauce is to blend a couple of the baked apple pieces and mix the puree into the cream sauce. 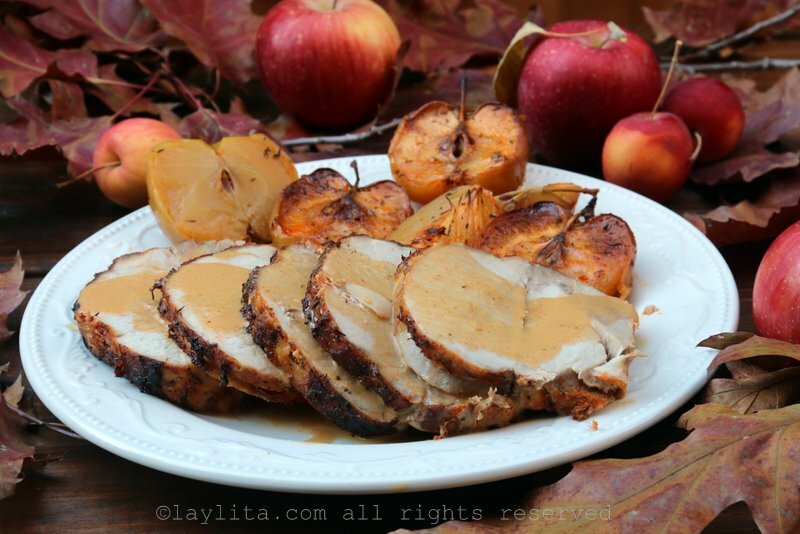 Slice the roasted pork loin and serve with the sauce and baked apples/vegetables, plus your choice of side dishes. Maybe it’s just me, but the last few months of the year always seem to go by the fastest. As much I have the best intentions of being productive, I am usually running late and doing everything at the last minute (from sending Christmas cards – which typically end up being New Years’ cards, to holiday baking). This year we decided, very last minute, to come spend the holidays with my family in Ecuador. So, for once I actually got Christmas cards mailed early, but everything else was delayed. 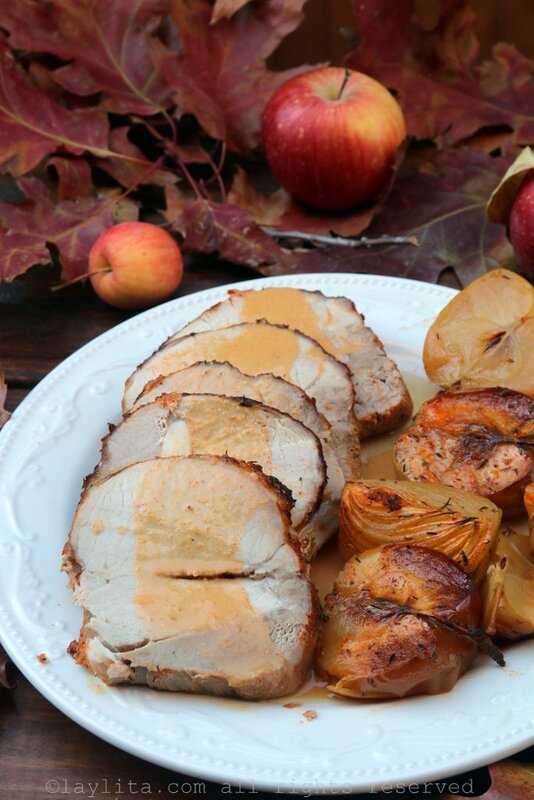 I prepared this apple cider pork loin around the same time as I made the apple cider sangria, during my Washington apple and apple cider inspiration/obsession days. I used a semi-sweet hard apple cider for this recipe, but you can also use a non-alcohol apple cider if you prefer. Depending on the size of your baking pan, you can just add apples and onions, or you can also include additional vegetables such as carrots/potatoes. 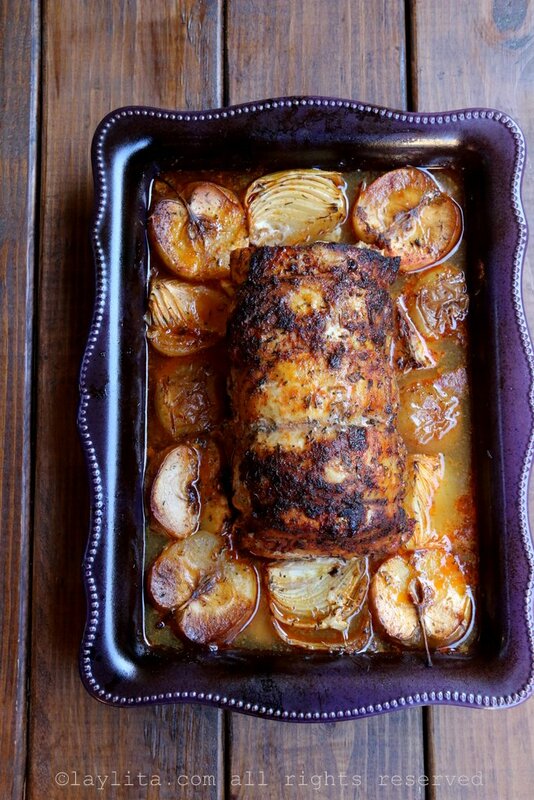 I made incisions into the pork loin with a sharp knife and then stuffed whole garlic into the meat – something that my husband and his dad always do when preparing any type of meat roast. 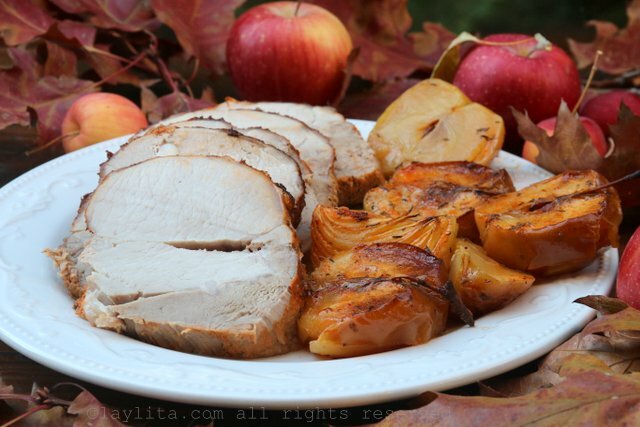 If you wanted additional apple flavor in the meat, you could also peel, core and thin slice an apple; and then stuff the apple slices into the middle (pre-cut) part of the roast. 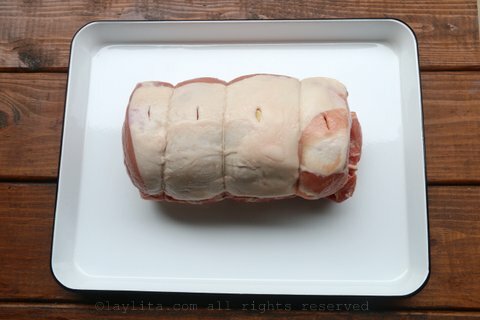 I kept it very simple this time, but will share stuffed pork loin recipe later on (when I get around to catching up with all the other pending recipes that need to be posted). 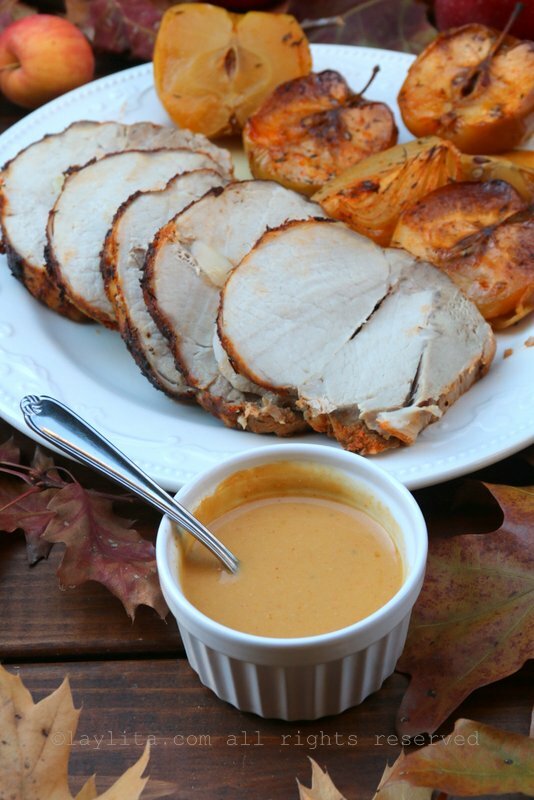 To serve the roasted pork, I prepared an apple cider gravy sauce by reducing the roasting juices and mixing in some cream, balsamic vinegar, and Calvados (an apple brandy). 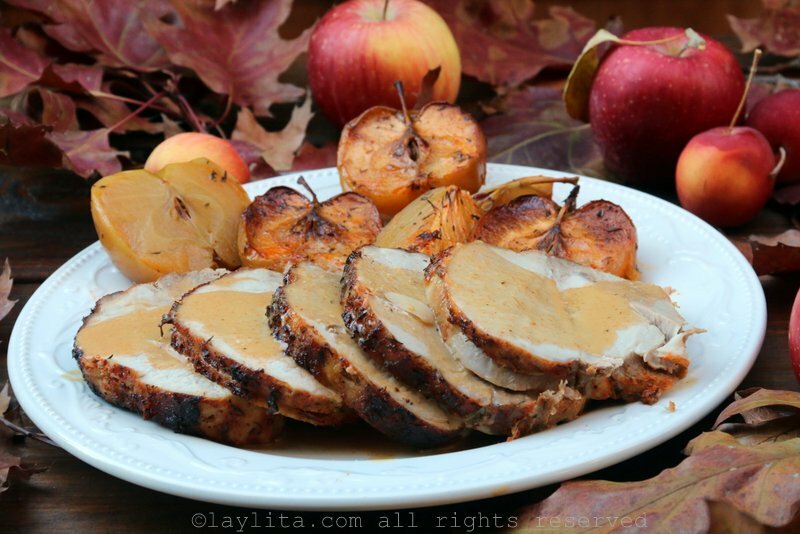 You can also make a puree with some of the baked apples and incorporate it into the sauce for a thicker variation. Another use for the apples is to add some of the puree to mashed potatoes that can be served as a side dish for the pork.